Sustainable and organic do not mean the same thing. Beyond the limited scope of the U.S. Department of Agriculture's National Organic Program (NOP), there are no strict rules set up to ensure that organic farmers or organic food production operations follow eco-minded practices. For members of the organic industry, it's important to be realistic about the limits of organic certification.﻿ You should be able to separate organic food facts from sustainable food facts so you can market organics honestly and successfully educate organic consumers. Here are eight major differences between sustainable food and certified organic food. USDA Certified Organic is a real, government-sponsored certification. Sustainable is not a certified label or any kind of official policy. Instead, most people consider sustainability a philosophy that describes planet protective actions that can be continued indefinitely, without causing damage to the environment. That said, while you can't officially label a food product as "sustainable," sustainable farming is not just a philosophy. Sustainability is observable and measurable via economic profit, social benefits for the community and environmental conservation. Less is almost always more sustainable than more, no matter if you're dealing with the stuff you own, the size of your home, or yes, even the size of the land you farm on. A sustainable farmer may own less land and grow diverse crops to help enhance the soil and conserve land resources. A sustainable farmer might also experiment with verticle planting or allow animals to graze on cropland to save space. An organic farmer may use more land than necessary and waste resources because land size is not covered by NOP policy. NOP policy doesn't require that farmers or processors attempt to conserve water resources. Sustainable farming and processing methods do try to​ conserve water. 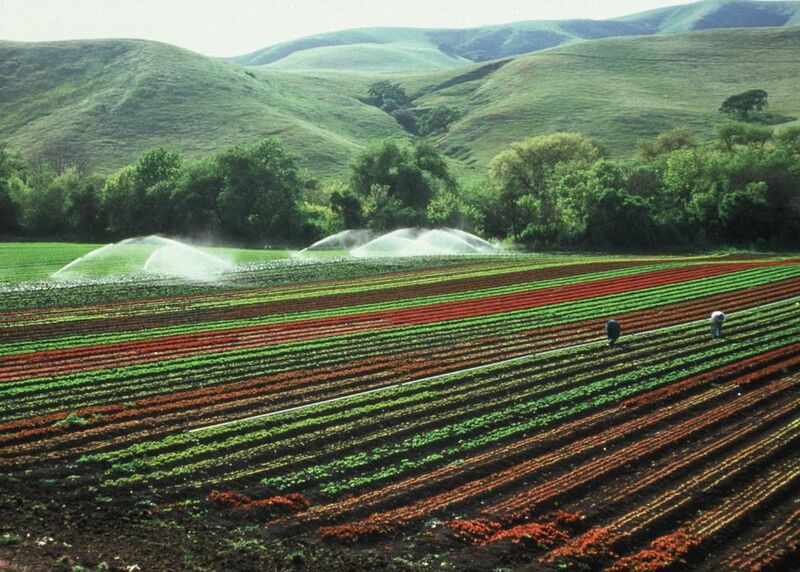 Sustainable farming methods may include using reclaimed water for some crops, planting drought-tolerant crop species or using reduced-volume irrigation systems. NOP policy says that reclaimed water can be used to water crops. Most modern farms (even organic farms) and food processing plants are heavily dependent on non-renewable energy sources, such as petroleum. Sustainable food farmers and processors know that the continued use of non-renewable energy can't go on forever, and thus attempt to conserve energy now, not later. A sustainable food system may rely partially on alternative energy sources such as wind, solar or water-based power. If your goal is to help lower emissions, then local sustainable food, not organic food, is your best bet. Organic certification does not cover issues such as fossil fuel used for food production or food transport. Many organic food growers and companies ship organic food products thousands of miles from farm to warehouse to store and elsewhere. Ideally, locally-grown organic food is optimal for health and low emissions. However, in terms of fossil fuel use only, organics can't usually compete with locally grown sustainable food, unless an alternative fuel is used for transport trucks. Organic certification policy includes extremely limited rules about animal access to pasture, but the USDA does not officially mandate animal welfare and well-being through NOP. Organic livestock can spend a lot of time in confinement with little thought given to their overall well-being. In a more sustainable livestock system, a farmer considers the well-being of livestock and will provide ample outdoor space so that animals can root, peck and graze naturally. A sustainable farm provides a more comfortable indoor space as well. Human treatment of animals is something any farmer can or cannot choose to implement, but organic certification certainly won't ensure decent animal treatment. Sustainable food means considering the final packaging. For example, you can grow perfectly organic strawberries, then place them in tiny plastic bins, then cover them with plastic shrink wrap, then wrap everything in a bigger box. That's a ton of packaging and not so eco-friendly. Another example is using glass over plastic. Plastic containers, made with non-renewable petroleum, are less eco-friendly than fully recyclable glass containers. Sustainable packaging uses the least amount of resources necessary. Ideally, sustainable packaging should be 100% recyclable and printed with eco-friendly inks as well. Not all certified organic food is packaged in such a sustainable manner. Organic certification is nice, but NOP policy doesn't mandate that a farmer or company act sustainably and ethically. For example, farming decisions based on sustainability should extend to other issues, such as a paperless office, incentives for using less gas-based transportation, protecting community beyond the farm, and fair working conditions for workers. True sustainability extends beyond basic farming goals into management and individual goals and lifestyle choices. Organic policy doesn't cover much in terms of full company or full farm sustainability, but a truly sustainable business attempts to be eco-friendly in many ways, not simply with how food is grown.